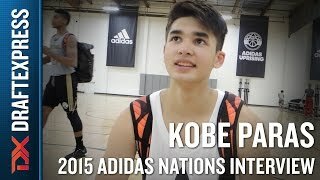 An interview with 6-7 wing Kobe Paras of the Philippines at the 2015 adidas Nations in Los Angeles. Read his scouting report here. -Excellent physical profile. 6' 7 with a strong frame (upper and lower body) and long arms. -Bouncy athlete. Good first step. Can play above the rim with ease. -Shot 27/73 (37%) for 3 and 55/71 (71%) from the free throw line this summer in 21 adidas event games. -Can straight line drive. Comfortable with the ball in his hands. -Has the tools to be very good defensively. -Average passer who has room to improve on his feel for the game. Almost always looking to score. Loves to isolate and force up off balance jumpers. Tunnel vision while he's on the move. Throws up wild layups. -Average finisher around the basket. Lacks a degree of toughness and physicality. -Shot just 47% for 2 this summer in 21 adidas event games. -Has some edge to him but not always in a positive way. Talks a lot of trash. -Comfortable, but not an advanced ball handler. -Needs to improve his footwork off the bounce. Every pull up is into a jump stop rather than a 1-2. -Jump shot can be a little streaky. Flings the ball at the rim from time to time. -Not always engaged defensively. Can do a better job bending his knees and sitting down in a stance. Paras, who came to the US two years ago, is the son of Benjie Paras, a famous basketball player, TV actor and movie star in the Philippines. He has the physical profile, athleticism and shooting ability of a high-major wing, and potentially a NBA prospect. He can score at all three levels, finish above the rim and has the tools to be a very good defender. The UCLA commit, however, has a long way to go in terms of playing the game the right way and fitting into a team scheme. He does a lot of things that may earn him a very short leash very quickly under head coach Steve Alford. With that said, if Paras is willing to put in the work and can find a way to think the game at a higher level and become more of a team player, he has a chance to be a high-level player in the Pac-12 and set himself up for a successful future beyond the college ranks., possibly in the NBA depending on how his skill-set evolves.